It&apos;s not hard to find a spotlight on Granbury in many of Texas&apos; most well-known publications! A quaint town with an historic southern charm.. what&apos;s not to love? 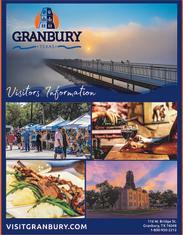 The team at Visit Granbury Inc. works very hard to earn Granbury&apos;s print presence and showcase the many wonderful aspects of Granbury. Enjoy some of our recent favorites below!